A bold look at the African-American psyche, this ambitious drama forged on a modest budget lacks focus and precision, but is impassioned with a sense of black pride and hope. Written and directed by Sabura Rashid, Greener Grasses explores racial anxieties with some dramatic clutter. Although modestly profound in certain respects, it is tarnished by tangled sub-plots and too many characters. Two cultural settings, nineteenth-century slave quarters and a twenty-first-century urban neighborhood, coexist on stage, with a slave auction relevant to both periods serving as the partition. Is it a bridge or is it a gulf? Neither. The slave auction is an anvil, both to the detriment of the African-American consciousness and to the structure of this drama. Rashid aims to get to the root of destructive African-American behavior by returning us to a time when the African sense of pride was attacked and mutilated, creating the misinformed, lazy perspective that permeates black culture today. She targets slavery, or rather, the slave mentality, as the catalyst for this dissonance. Through visuals, she deftly presents dignity and self-awareness as emblems that, once ravaged by slavery, are now freely given away by young black men and women. Her assessments are as potent as those of a psychologist: for example, that the oppressed sometimes assume the same characteristics of the oppressor. However, the narrative is often chaotic and needs clearer lines. Rashid uses monologue in the opening sequences to demonstrate how--in hue, outlook and diligence--black people's desires have lightened over the centuries. What white men have initiated, black men have sustained and allowed to rip through their unity. These monologues, though pertinent, suffer from too many trite phrases that should have been edited. They duel with the slave exhibit in the foreground of the stage, and lose. This lack of focus does harm to what is arguably a poem to the black community. Four slave archetypes, still prevalent in today's black society, are examined: the newly uprooted, the defiant, the scared, and the brainwashed. It is here that black-on-black crimes are also introduced. Using a split-stage technique popularized by film, Rashid cleverly presents some of those same characters in a modern, junior high-school setting. It is here that the problems with educating black youth are discussed. That George W. Bush's likeness is prominently displayed in the center of this setting is a silent finger on the holes of his "no-child left behind" program. The technical segues into different eras and subplots need to be crisper, and the cast would benefit from more overt direction. Violent moments were often nonsensical, poorly choreographed, and jammed in like the wrong jigsaw piece. Anachronism, too: modern inventions, such as a set of headphones (not invented until the 1930s) on the head of a "pickaninny." 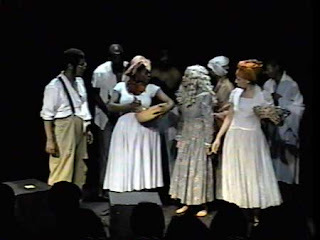 The play also suffers from a large cast: the presence of several characters played by Kennitta Lindsey and April McCants could have been omitted. As the sole Caucasian actor, Bill Weeden's poorly applied facial hair and makeup is as distracting as his fumbling speeches. Lisa Roxanne Walters's Ms Padget is a Nubian queen in need of Sista Souljah, and her performance as Abigail is flaccid. Although Rebecca Thomas's Principal Frost and Mrs. Achebe are excessive, her Sharon Robinson is fiery and right on the nose. Chiquita Camille and Thyais Walsh, Maggie and Martha respectively, shine as slave sisters bonded by misery and hope. Greener Grasses does not lack for potential or influence. It is emotionally charged and laden with social parallels that are clever and challenging to the theatergoer. There is some startling imagery, good songs, and occasionally, a potent line of dialog that lassos you back to Rashid's original intent: a rise, not to arms, but rather to action and to a dream for re-assembling what was stolen. As in the adage, "the grass is always greener on the other side", Rashid's purpose is to let black people know that it may be greener than enslavement and the Jim Crow era, but much can and still needs to be accomplished. It is the modern black person's responsibility to shoulder their ancestor's dreams, and realize them both in mind and body. Although heavily doused in tragedy and pain, black history has had some triumphs, and Rashid calls for the pursuit of more. January 11th 2007- February 4th 2007 Thursday-Saturday at 8:00, Sunday at 3:00 Theatre For The New City 155, 1st Avenue Special Performance Monday January 15th at 8:00 pm for Martin Luther King Juniorâ€™s Birthday. Tickets $15 per person: Available from www.theaterforthenewcity.net or at (212) 254-1109.